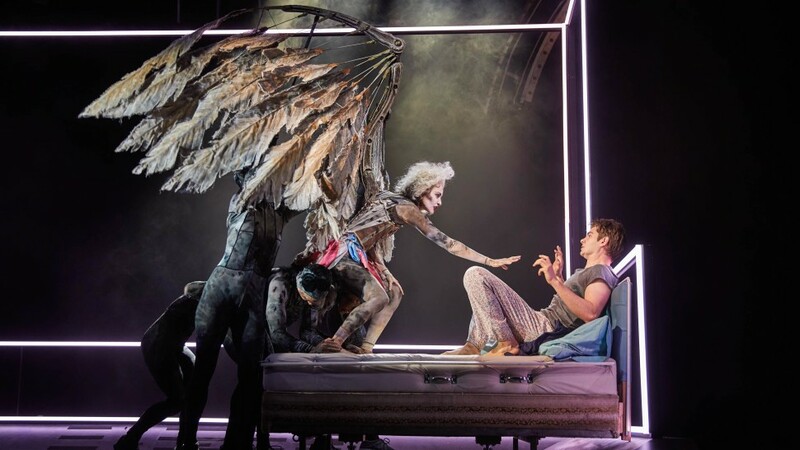 A commendable theater experience, London's National Theatre's revival of Tony Kushner's Angels in America, has arrived at the Neil Simon Theatre with the same powerful significance it had at the time of its original production in the early 1990's. Looking back to that time of d the chaos surrounding AIDS and the Cold War, a timeliness continues, strikingly emphasized by an estimable cast of actors whose impressive energy delves into the American mind and soul. Directed by Marianne Elliot (War Horse, The Curious Incident of the Dog in the Night-Time), the epic revival ignites the same emotions as the earlier versions, eliciting more humor than I remember. Although the time has changed, the essence remains -- "More Life," struggles with change, humanity. Unfortunately, while the character of Roy Cohn, leaves this world in Angels, his dreaded legacy still weaves through our lives, intolerance and prejudice continue, and concerning the plague, while people with HIV and AIDS are surviving today, controversy over treatments goes on. The two-part, almost eight-hour production won its playwright a Pulitzer Prize for Drama and seven Tony awards and has been considered a theater masterpiece for the past quarter of a century. Part One (Millennium Approaches) presents the threatened landscape. In Part Two (Perestroika), comes the tearing apart and approach of renewal. Much of the humor comes from the cast, many actors playing several roles. Outstanding is Nathan Lane (The Front Page) in surely his finest performance, reviving the hateful conservative lawyer, Roy Cohn, while dredging out the fury, desires and fears that Cohn protected while hiding in his closet. Lane, a master of comic timing, uses it with brilliant viciousness to portray the lawyer who insists he had liver cancer, not AIDS. Cohn knew his power and how to use it. "Because what I am is defined entirely by who I am. Roy Cohn is not a homosexual. Roy Cohn is a heterosexual man...who fucks around with guys." With his phone, he could get to anyone, any time. Equally magnetic is Andrew Garfield (Death of a Salesman), playing Prior Walter, the flamboyant "queen," engaging from the moment he finds his first lesion until the dramatic hallucinations of meeting the Angel and deciding heaven is not for him yet. He is unflagging in his moments of agony, not only from the disease but from the abandonment of his lover, Louis Ironson (James McArdle). Prior's furious battles against death are extraordinary. McArdle is impressively complex in his role of Louis, self-absorbed, ridden with guilt and vulnerability and expressing himself with exhaustive verbomania. Also suffering is Harper Pitt (Denise Gough), addicted to Valium and ignored by her husband, Joe (Lee Pace), a handsome ambitious lawyer who catches the eye of Roy Cohn. Joe and Harper are Mormons, moving in separate directions in the chaos of the new city. Harper escapes into hallucinations yet strives to steady herself. Joe wanders the streets, pulled between his well-hidden homosexual tendencies and guilt about his wife's mental illness. A standout supporting player is Nathan Stewart-Jarrett as the voice of wit and reason, an audacious and nurturing African-American nurse, called Belize, who was once Prior's lover. Notice how he holds his ground beautifully and effectively against Roy Cohn. Susan Brown astounds all, playing seven different characters including Joe's Mormon mother, Hannah Pitt, Rabbi Isidor Chemelwitz, and the ghost of Ethel Rosenberg on a death watch, quietly haunting the dying Cohn. Elliott's creative scenic designer, Ian McNeil and lighting designer Paule Constable, bring to the stage a magical panorama of neon lighting on swiftly revolving spaces defining apartments, halls and hospitals, expanding to Central Park or Antarctica. In Part Two, a riser lifts to heaven and descends back to earth, with subtle shades of dark and light and featuring a neon ladder. (Two hallucinatiry segments, Prior in heaven and Harper in Antarctica, appear to me unnecessarily drawn-out.) Costumes by Nicky Gillibrand are period-appropriate although fashion-conscious Belize can swan around proudly with splashes of color. For the Angel who finally arrives after climactic proclamation, Elliott chooses a nightmare vision of spine-tingling theatricality. Finn Caldwell's black-clad puppets ("angel shadows") carry Angel, Amanda Lawrence (alternately Beth Malone), looming and hissing over Prior, her menacing luminescent gray wings with unfortunate moments of clumsiness. Blasting sounds of shock are designed by Ian Dickinson and Adrian Sutton provides original music. The span of emotions, metaphors and great philosophical themes of life and death with the depth of humanity comprise both Parts One and Two. Half-real and half-dream, Angels of America is exceptional and as essential today as it was in the days that inspired it. It is a stirring production that every theater-lover should see. You can split the two parts over two nights as I did, or watch the whole thing in one day. Cast: Andrew Garfield, Nathan Lane, Susan Brown, Denise Gough, Amanda Lawrence, James McArdle, Lee Pace, Nathan Stewart-Jarrett, Beth Malone, others.